Did you know that 44% of the infants in the United States receive vouchers from WIC, the joint state and federal Women Infants and Children supplemental nutrition program? These vouchers purchase milk, cheese, eggs, juice, vegetables, tuna, peanut butter, and cereal. The WIC program does not allow the purchase of these products if they are labeled ORGANIC. Therefore, many mothers in the WIC program are denied the option of making sure their children’s diet is free from chemical residues and genetically modified foods AND none of the federal or state dollars that funnel through this large program to support organic farmers. Don’t you think that low income mothers should have the choice whether to purchase organic foods for their precious children? Since children’s systems are physiologically immature, they don’t have the immune system filtering ability to defend themselves adequately against these compounds. Children eat more food per pound of body weight, which increases the “mg/Kg” of pesticides consumed. Children also have less variety in their diets, making each food, such as apple juice, a larger component of the diet. Therefore, children are exposed to higher doses of pesticides than their adult counterparts. The National Academy of Science specifically recommends that we delay the age of first exposure to carcinogenic and toxic pesticide residues. It is essential for WIC recipients to have the ability to choose organic foods, which are grown without these substances and which are tested regularly – not randomly – for possible contamination. Since carcinogens are measured by “lifetime load” risk levels, why wouldn’t we want our most nutritionally at risk population to be protected from reaching lifetime load levels early in their lives? (It was estimated that infants consume 35% of the lifetime load of one particular fungicide by their first birthday.) Please support our effort to allow WIC recipients to follow the recommendations of the National Academy of Science through the option of buying organic foods with their vouchers. 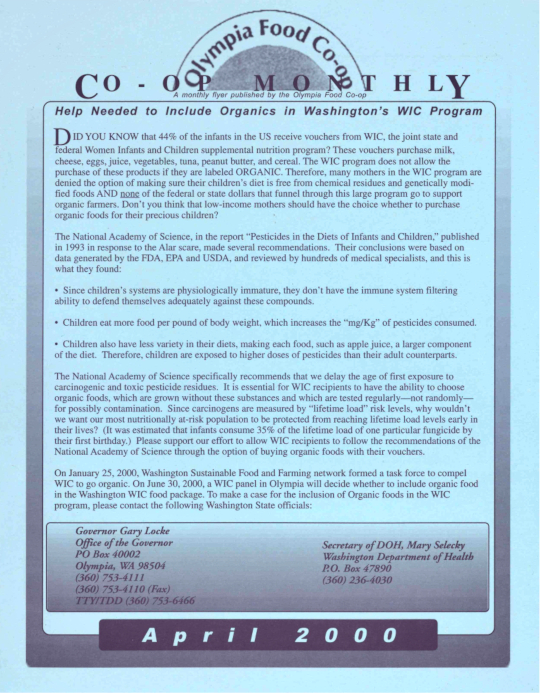 On January 25, 2000, Washington Sustainable Food and Farming network formed a task force to compel WIC to go organic. 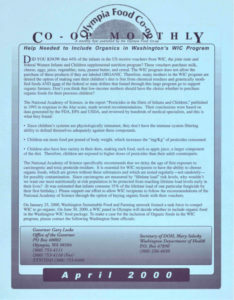 On June 30, 2000, a WIC panel in Olympia will decide whether to include organic food in the Washington WIC food package.